Chef Tim Tibbitts of Flying Fish giving a demo during Culinary Fusion 2014 at Pelican Bay Hotel's Canal House. Grand Bahama - Calling all Chefs, Cooks, Mixologists, Breweries, Bakeries, Restaurants and Hotels! The organizers of the 2015 Meeting of the Minds: Culinary Fusion Expo is inviting you to get registered for this year’s event! On November 7th, 2015 at the Pelican Bay Hotel, MOVE Marketing, along with sponsoring entities including; The Ministry of Tourism, Bahamas Weekly, Bahamian Brewery and Bristol Wines will bring to The Bahamas, by way of the island of Grand Bahama, a forum for the select exchange of culinary ingenious. With what has become synonymous with entertainment for all ages and backgrounds, the Bahamian culinary arts community, through the organization of the event creative team, has successfully produced and branded a unique and tasteful signature event. 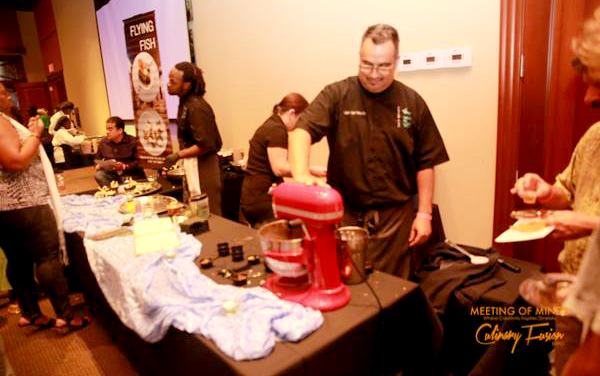 For the past two years, the annual Culinary Fusion Expo, held at the Pelican Bay Hotel, has attracted hundreds of attendees, all craving the artistic showcase that the event offers. Coming off of the heels of the committee’s largest event to date, the 2014 Culinary Expo left the local community in a wave of excitement and served up international appeal to visiting journalists from Canada and the United States, leaving their followers craving for more. Organizers are poised and ready to host this expo for another year in anticipation of an even greater event. Last year was also the first time that the event was open to other islands for participation. As a result of greater inclusion in the event, the organizers have received nothing but positive feedback from both New Providence and the Abaco islands. The event is all about networking and expanding clientele for the vendors, whether it is business-to-business or people opportunities and the Meeting of the Minds: Culinary Fusion event is the arena to make this possible. The vision of the Meeting of Minds is to provide a flexible platform where businesses can determine how much of an impression their brand makes. During the showcase afforded to Food and Beverage professionals at the event, everyone is on a leveled playing field and it is left up to the individual vendors to determine how much they can stand out amongst the competition through displaying their creativity and the quality of their product. The road to the Culinary Fusion Expo 2015 will be captured during an extensive media tour throughout the month of October and will consist of radio, TV, newspaper and social media outlets. The tour will feature more information on the upcoming expo, vendors and the current state of the food & beverage industry, including what's new and who's who. Persons can register for the Meeting of the Minds: Culinary Fusion Expo 2015 through contacting Sean Johnson at move242@gmail.com or in Grand Bahama at the Ministry of Tourism, Poinciana Drive. Registration deadline is September 11th.